Should we make children write thank you notes? Christmas presents are opened and wrapping paper thrown away. New gifts have been folded into old possessions with toys on the shelf and clothes hanging in the closet. Now it is time for the dreaded thank-you-note routine. 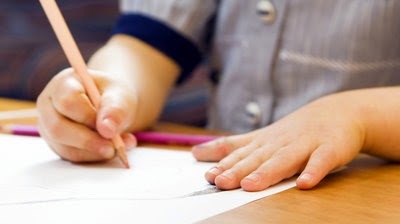 This NPR story brings up a good question: should we force children to write thank you notes if they are not sincere? Will we promote a bad attitude about thank you notes or, if we don't make this requirement, will we teach that gratitude is not important? I think it depends on your goal. If we teach children that we have to write thank you notes because it is expected, then I doubt that the action will promote sincere gratitude. But, if we understand that the goal is to teach empathy, then our actions might have a more desirable result. Child development experts used to think that young children were incapable of empathy. Recent research shows that children as young as 18 months are capable of understanding the desires of another person. They just aren't very practiced at it. I love the suggestion of the article to allow children to do less conventional thank you notes. When completing this task with my young children we often got out the watercolor paints or other art tools and created pictures for each person receiving a thank you. I think this can be a great way to show thanks, even for older children. What is important is that children learn that the gift giver thought about the child and what the child might like. The thank you sent by the recipient should ideally do the same. It doesn't mean that the child should be forced to show insincere gratitude. A forced thank you note is an expression of law. Empathy is an expression of grace. The attitude of gratitude comes from a place of grace, not law. It is right to refrain from forcing children to give an insincere thank you. However, if you do not teach a child such actions how will he or she learn them? Teach your child empathy and let God grow gratitude out of that learning. Speaking as your child, thank you for making me do those. Now I do them and MEAN it. It pays off in the long run.